BBC micro:bit Starter Pack. The starter pack contains a BBC micro:bit, a 1M anti-tangle USB cable, a AAA Battery cage and 2 x AAA Batteries. BBC micro:bit Starter Pack. The Starter Pack consists of a BBC micro:bit, a 1M anti tangle USB Cable, a Battery Cage and 2 x AAA Batteries. It contains everything you need to connect your BBC micro:bit to your computer and also enables you to power your BBC micro:bit once you disconnect it from the USB. Your BBC micro:bit will come in one of 4 colour schemes, unfortunately it is not possible to specify which colour you will receive. The BBC micro:bit is the spiritual successor of the BBC Micro of the 1980s, which itself introduced a generation of children to computing. The BBC micro:bit carries on this 30 year tradition and does it 18 times faster and is 70 times smaller than its predecessor. 1 x 1M Anti Tangle USB Cable. BBC micro:bit quick start guide. Our extensive range of BBC micro:bit resources. Note: Due to Country specific trademark restrictions there may be some Countries that we are unable to ship the BBC micro:bit to. In the unlikely event that this occurs we will fully refund your purchase. Get up and running quickly with the five minute microbit guide. It covers everything you need to begin using your microbit straightway. First of all, we cover the essential topics required to get you up and running. And finally, there are a couple of links at the end to point you to more free guides to help you develop as a coder. Find out more! 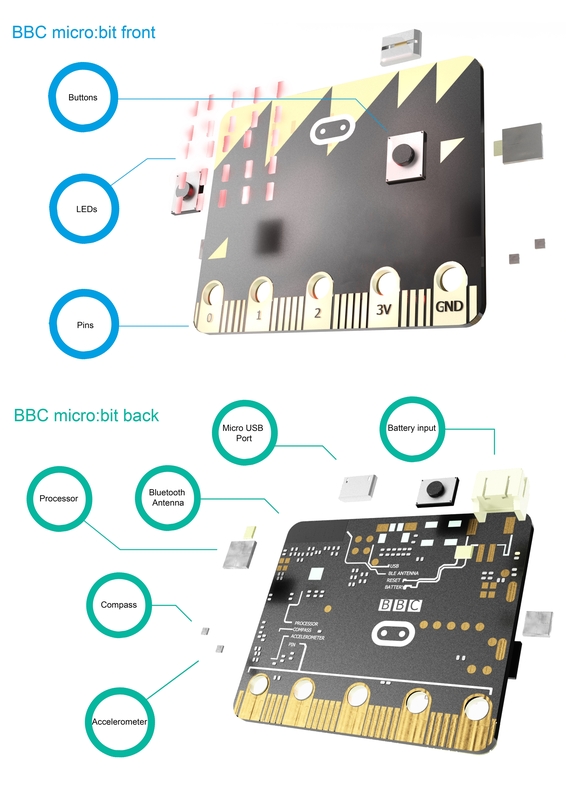 We are very pleased to introduce the Kitronik Parent's Complete Guide To The BBC micro:bit. We've created this free resource to help parent's get actively involved in helping their children learn how to code. The guide contains everything you need to introduce your children to the microbit, even if you have no prior coding experience yourself. By popular request on twitter, Kitronik Technical Director Dave Sanderson shows you how you can build a totally Klawsome microbit controlled Tank. Our good friend, David Booth, has designed and built a microbit lap counter for a Scalextric type car track and we think it's fantastic. Learn how he did it and make your own. As we've recently added a 360 degree continuous rotation servo to our range of stocked products, we thought it would be useful to do a quick tutorial on how to control one using a BBC microbit. This resource consists of a selection of links to the additional resources that we have created to accompany each of the experiments. Each experiment has a walk-through video that also contains hints and tips designed to help you complete the experiment and to understand how the circuits work, we have also included links to additional code examples. In this tutorial we are going to highlight how easy it is to code the BBC micro:bit as an instrument tuner. We will focus mainly on making a Guitar tuner but we will also provide download links for several different types of tuner. In this tutorial we are going to look at how to control a servo using the BBC micro:bit via an Edge Connector Breakout Board for the BBC micro:bit. It’s super simple to set up and requires very few parts.